Take out a globe, take it for a spin, and stop it with your finger. Where it lands, you will find the cuisine somewhere on the beach. Miami is known for food and glamour therefore, these dining options are all destinations in their own right. Located on Collins Avenue, the outdoor space stuns as do the Mediterranean-Asian fusion offerings. What makes the restaurant a destination is the Omakase style dining. Roughly translated into I trust the chef from Japanese. Rather than choosing your meal, you trust the chef to provide you with what he or she is most proud of that day. Make reservations for the exquisite brunch and fine dining options throughout the week. Bruch is an event in Miami. It is not enough to be seen and heard on a Saturday night; Sunday is also now a time to dazzle. Indulge in some hair of the dog with unlimited mimosas and bellinis. Enjoy lemon ricotta pancakes or hearty fare such as the Tuscan beef stew. Pay around forty dollars for the lively atmosphere and the chance to dine with the glitterati of Miami Beach. The legendary New York steakhouse has a home at the southernmost point of South Beach. Premium aged beef and refreshing cocktails compete with the stunning patio views. Miami’s cruise port and the majestic skyline create the backdrop for a T-bone complete with a glass of wine. Local flavors are incorporated with such fare as the mango salad. Expect a memorable experience and do a little celebrity watching as you feast under the stars. Locals and tourists alike flock to Lincoln Road Mall. The mid-century founded outdoor mall, offers some of the best al fresco dining in the world. Juvia’s rooftop crowned dining space overlooks the tropical city and gives diners a bird’s eye view of America’s Riviera. As a winner of the James Beard Foundation restaurant award the menu blends Euro-Asian-Latin cuisine with a focus on tapas. The vertical botanical garden designed by Patrick Blanc, a famed plant aficionado, was inspired by the Amazon’s lush rainforests. Every bite in a lush background demands a reservation asap. 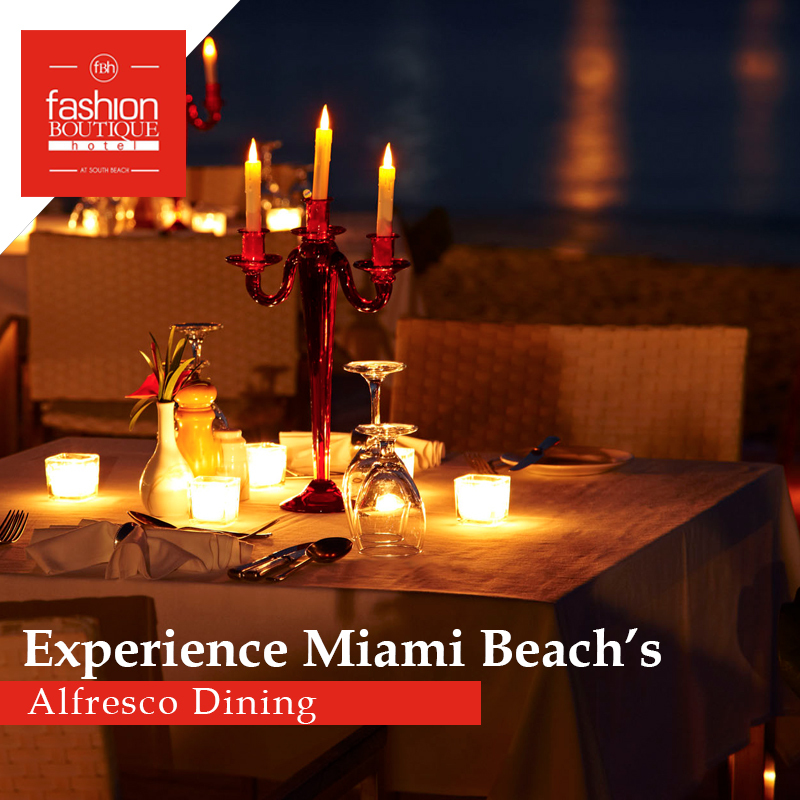 Experience Miami Beach in the best way possible via al fresco dining. Allow the saltiness of the waves to awaken your palette and the fusion offerings to delight your senses. Baoli allows diners to trust the chef for their sustenance. Terrazza turns brunch into an event with their unlimited cocktails and a variety of dishes for every taste. Smith & Wollensky makes New York snowbirds feel at home with their quality-aged meats. Juvia sets the gold standard in rooftop dining. The choice is yours so make a reservation to make your alfresco dining an experience.